Bodog Poker has traditionally been a very good site for freerolls since they’ve always held plenty of free poker tournaments. They’re certainly keeping this reputation up too by running a couple of different $7,500 PTS Freerolls every month. The $7.5k Freerolls happen on the second and last Saturday of each month, and the top 20% of the field gets paid. It’s also worth mentioning that the winner of each freeroll will earn a huge $1,000 prize. The best place to lead off with the Bodog Poker promotions is the Poker Points. As we discussed in the Bonus Code section, Poker Points are earned in tournaments and cash games. 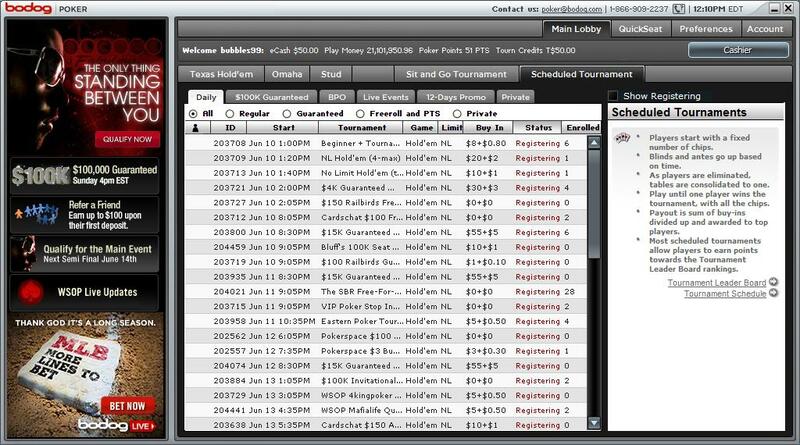 In addition to unlocking the Bodog Poker bonus, players can also exchange PTS for cash or use them to enter tourneys. The exchange rate is 100 PTS per $1, while the amount of PTS needed to enter poker tournaments all depends on which particular tourney you’re interested in. There is no code you need to worry about when trying to get the Bodog Poker signup bonus. Instead, you can simply click one of the links on this yPoker.com page, download the software, create an account and make a deposit. Once you’ve completed these steps, you’ll be in line for the 110% match deposit bonus up to $1,100. To illustrate how the match bonus works, if you deposited $500, you would have a chance to earn an extra $550 in cash. Great commitment to recreational players. Very soft low stakes competition. No poker tracking software allowed. 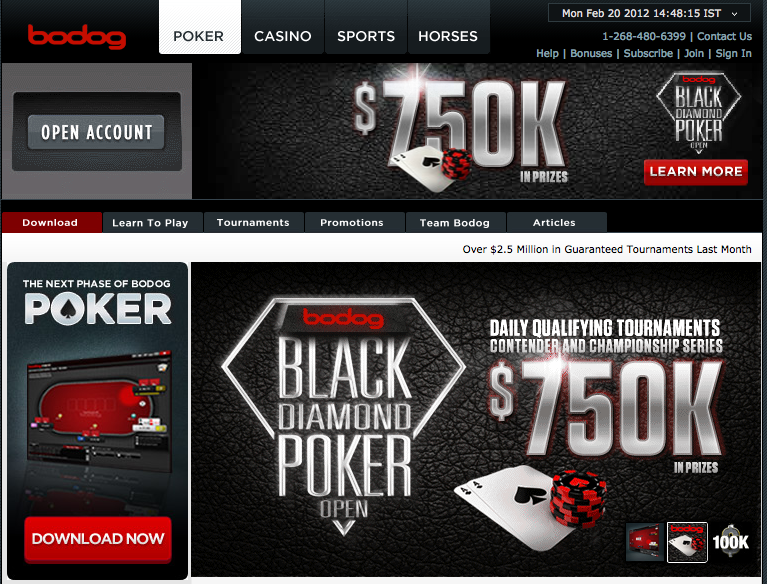 Bodog is an online poker room that has undergone some very interesting changes in recent times. First off, the Bodog brand decided to pull out of the United States market in order to focus their efforts on other countries. Fortunately, former US Bodog customers were offered an alternative in Bovada Poker, which is run by the Morris Mohawk Gaming Group. 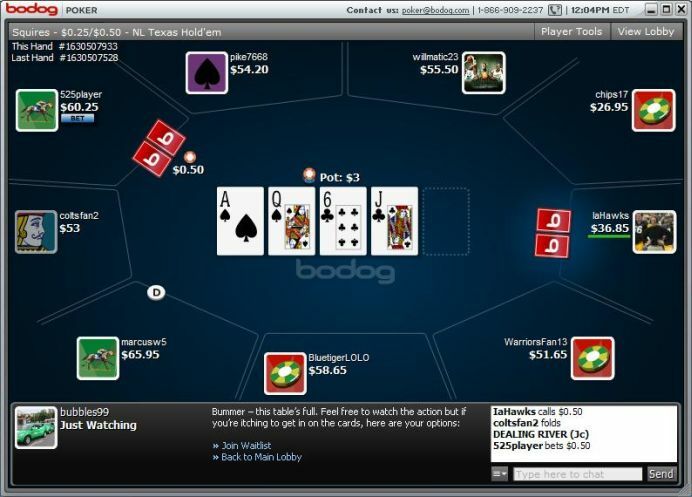 Bodog and Bovada are very similar to each other in terms of software and features; the only major difference is that US players go to Bovada, while non-US players continue to play at Bodog Poker. Moving along, another interesting aspect of Bodog’s recent changes includes their commitment to the “Recreational Poker Model.” The name says it all in that this site is doing everything to protect their heavy base of recreational poker players. One of the main things this involves is blocking the use of third-party statistical databases that give skilled players stats on their opponents. Bodog has gone so far as to wage public fights with poker tracking websites and companies just to protect their recreational clientele. In addition to this, the software also features anonymous heads-up poker tables where player ID’s are concealed. This is ideal for preventing professional and semi-pro players from waiting around for fish before clicking a seat. Taking this and the lack of poker tracking into account, the Bodog Poker competition is extremely soft at most stakes, thus making it perfect for recreational and new players. On the other hand, skilled poker players who rely on tracking software won’t appreciate the fact that they can’t use this advantage. As for the software, this site has been working hard to improve their product over the past few years – especially in the features department! Some of the helpful tools you can use here include multi-tabling (up to 20 tables), in-client blackjack, a bet slider, player notes and the rabbit cam (see non-dealt cards after a hand). The graphics get mixed reviews from players, but most would contend that these graphics are better than the industry average. Bodog’s game selection is pretty typical with most of the cash game and tournament action being focused on Texas Hold’em and Omaha. You can also find Stud games here, but the tables only get crowded during peak hours. Considering all of this, the traffic is above average at Bodog, and you shouldn’t have trouble finding a good Hold’em or Omaha game at any point in the day. One final point you should consider about Bodog Poker is that their customer service is among the best in the industry. Having been around since 1994, the company has been able to fine-tune their customer support department to a very impressive level. You can contact them through email, live chat and phone support.